We don’t remember a lot of college students at CBGBs. Everyone seemed to have either graduated, dropped out or not bothered going in the first place. Oh, but the high school students! They were one of the secret treasures of the scene. Completely illegal and utterly irresistible, kids from 13 to 17 showed up at the bar nightly, bringing with them an extra jolt of innocence, energy and reckless abandon. 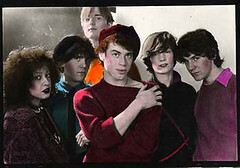 Bands like the Blessed, with 16-year-old Howie Pyro and Nick Berlin, performed frequently at Max’s and CBs and nobody blinked. Chris Parker, one of the underaged regulars at CBs, starred in Jim Jarmusch’s first feature, “Permanent Vacation.” And when local favorite X-Sessive graduated at 17 from roadie to bass player for the Voidoids, well, everyone was pleased. That’s our boy, we thought. These barely-out-of-junior-high-school hell-raisers weren’t just tolerated, they were our mascots. One of our favorite teenage bands was the Student Teachers. They met cute, when future keyboardist Bill Arning sat next to soon-to-be vocalist David Scharff and guitarist Philip Shelly at a John Cale show at CBs. Actually, Bill had come for the opening act, Lance Loud’s band, The Mumps, in his official role as president of their fan club. They were just 16. The three hit it off and soon, Bill introduced his pals, Lori Reese and Laura Davis. They did the obvious thing: they started a band. Joe Katz joined later as second guitarist, rounding out the lineup. “We were really big music fans, Bill Arning remembers. “We loved Sparks, and a lot of the glammy stuff. But once Patti Smith and the Ramones and Talking Heads came along, well, it gave us license.” They started rehearsing and writing songs together in a space they found through The Mumps. They started doing dates regularly around the club circuit and soon Blondie’s Jimmy Destri offered to produce them. He suggested they work on their “image,” but it was not in the cards. “We were trying to avoid any kind of categorization,” Scharff said. ”We’d tell interviewers, ’we’re not new wave, we’re first splash!” But they did lay down some tracks which appeared on Red Star’s compilation, “2×5”. They lasted from Easter 1977 to Halloween 1980, providing a name for their final record, “Easter Halloween.” But a new CD reissuing their complete recordings is coming out soon. Punk legend Danny Fields is providing the liner note. “It was a great privilege to be there at that period,” Arning said. “We began in a cauldron where really interesting culture happened.” Kind of beats beer pong in Cancun, doesn’t it? Correction, April 13, 2013: This post was revised to correct errors. The original version misquoted David Scharff as referring to “Lori and Linda.” He actually said “Lori and Laura.” The band would tell interviewers “we’re first splash,” not “we’re splash” as originally stated. And the original version of the post spelled the surname of the lead singer Scharff and Scharf. The correct spelling is Scharff.